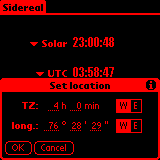 Sidereal is a very simple and small program intended to display continuously your local sidereal time. 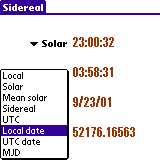 In addition to sidereal time, it can also display local time and date, UTC time and date, mean and real solar time, and the modified julian date. Emphasis is given to accuracy. 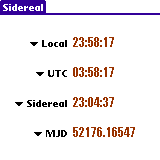 Sidereal is free software. The current version of Sidereal is 1.1. It is compatible with devices running PalmOS 2.0 or higher. It takes 10 kB of your handheld's memory. sidereal.zip (25 kB) contains the program (sidereal.prc), the manual (sidereal.html), the user license (COPYING) and the source files (src directory). Astronomers locate objects in the sky using a set of coordinates called declination and right ascension that are the analogous of latitude and longitude on the Earth. Right ascension is measured in hours, minutes and seconds, with one hour being equal to 15 degrees. The sidereal time is the right ascension of the point that is on the zenith at any given time. Astronomers use sidereal time to know the orientation of the sky above them and to set their telescopes accordingly. Rick Fisher has a detailed page about astronomical times. You need a handheld device running PalmOS. Install sidereal.prc like you would install any other Palm application. Start the program, open the menu item "Location...", set your time zone and your longitude, click "OK" and you are ready to go. Use the popup lists to select what items you want to display. For more details, you can consult the manual online. The manual is also provided as part of the distribution. The times displayed should be right to within a couple of seconds, except for the real solar time that is only accurate to about ten seconds. You should of course set your device clock and your longitude accurately if you want accurate times. I use BigClock to set my handheld's clock with one second accuracy relative to my workstation's clock, which is itself synchronized using NTP. Alternatively, you can consult the Official U.S. Time on the Web. If you have a color device, you can change the display to red-on-black to preserve your night vision. Modular display: choose 4 items among 8. Can display the date (local and/or UTC) and the solar time (mean and/or apparent). Times and dates displayed in brown. Moved the sources to the src subdirectory.